This is actually a magazine with a cd iside. 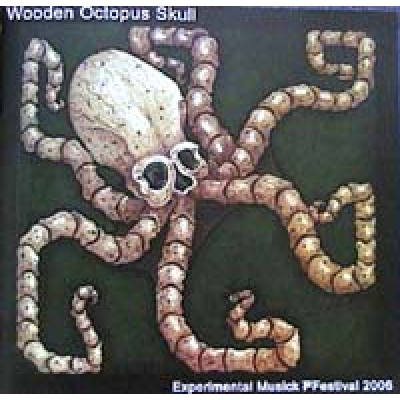 The zine is information about artists that did shows at the "Wooden octopus skull" experimental musick Pfestival september 2006 in Seattle US. The zine is released by Psychform and Enterruption Records and the cd by the now defunct label Stentorian Tapes. Recomendation!!! COMPILATION "Elektronik och Skrammeldisko Volym:1"
COMPILATION "RECUERDOS DEL FUTURO Un homenaje al sonido de Valencia"
COMPILATION "2013 - 2003 = 10 years of 4mg Records"
COMPILATION "Original Soundtrack - Exploitation"
COMPILATION "The Sound of Geri Reig"
COMPILATION "Herrens arm uppenbarad -En kristen samlingskassett-"
COMPILATION "Attractive! Too - For synth aficionados"
COMPILATION "Festival der Genialen Dissidenten"
COMPILATION "Manifesto Rumorarmonico Post Futurista"
COMPILATION "The Perils Of Paradise"
COMPILATION "Roulette Russe pour un peu de caviar"
COMPILATION "WNF Tag Team Noise Rumble Spectacular"
COMPILATION "5 September 1982 - A Tribute to John Cage"